This is a great recipe for a summer lunch or dinner – both easy to prepare and cook. To make it more substantial for dinner serve it with baby potatoes roasted with a little garlic and plenty of fresh rosemary. Once the asparagus season is finished swap to French beans instead. Edamame beans also work well it this salad and if you feel like it, serve the salad on a bed of rocket, baby spinach leaves or baby cos. In other words, it’s a very versatile dish for summer. In a bowl mix together the orange juice, lime juice, honey, rosemary and sage, garlic and salt and pepper. Add the chicken pieces and leave to marinate for at least 30 minutes. 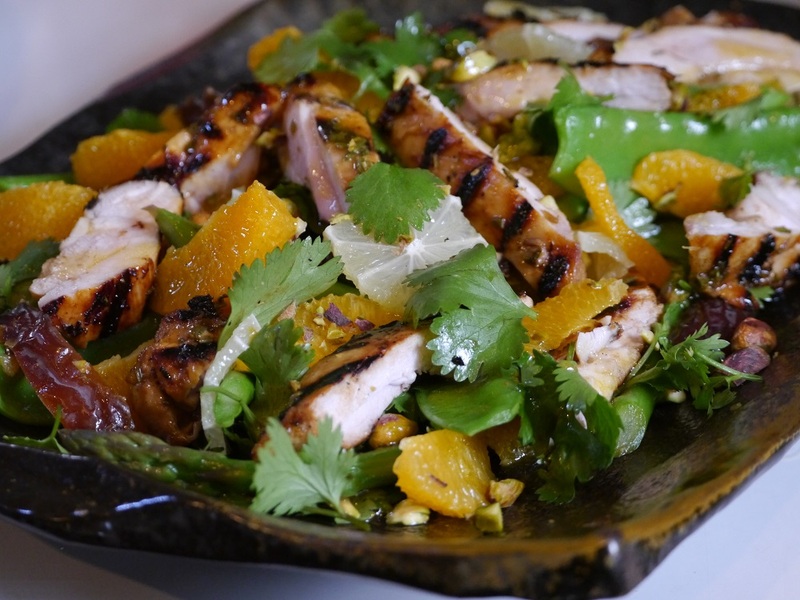 Place the orange segments, lime slices, asparagus pieces, snow peas, coriander leaves, date pieces and pistachios in another bowl and set aside. Heat the BBQ or grill pan until hot. Place the chicken pieces on the grill to quickly sear on one side. Turn down the heat a little as the honey in the marinade may burn. Cook for a few minutes on each side until the chicken is cooked through basting occasionally with the marinade. Remove from the heat and leave the chicken to rest before slicing. Make the dressing – put the remaining marinade in a small pot and simmer until the liquid has reduced to about ¼ cup. Strain into a small bowl. Whisk in the olive oil and orange blossom water. Check the seasoning. Place all the salad ingredients on a platter and top with the sliced chicken. Drizzle with the dressing. Serve with crusty bread and a glass of chilled rosé.